The following is an excerpt of a speech given during the Future Ready Internship Fair held at Ngee Ann Polytechnic. Read on to discover how disruptive technologies is impacting the Future of Work, and what should you do about it. 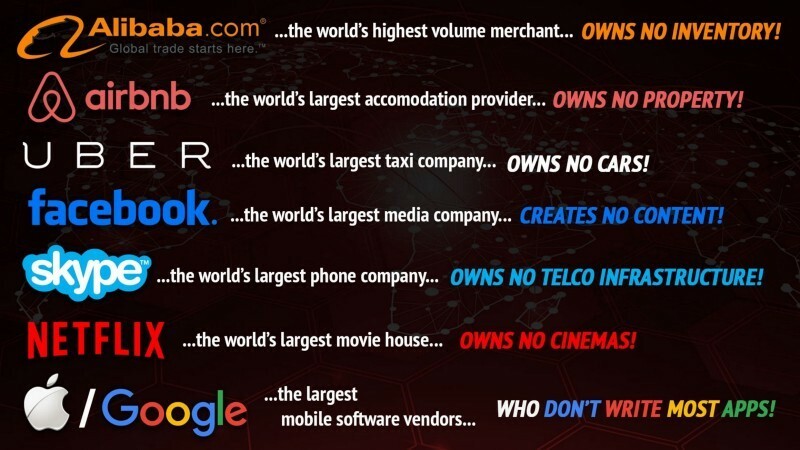 Airbnb, the world’s largest accommodation provider, actually owns no property. Facebook, the world’s largest media company (though they vehemently deny being one), generates no content. It does not take a genius to realise that traditional business models are being upended, and in a hurry too. What is underpinning such changes of unprecedented scale and scope is the rapid proliferation of technological innovations, and the increasing receptiveness of people, especially millennials, towards them. 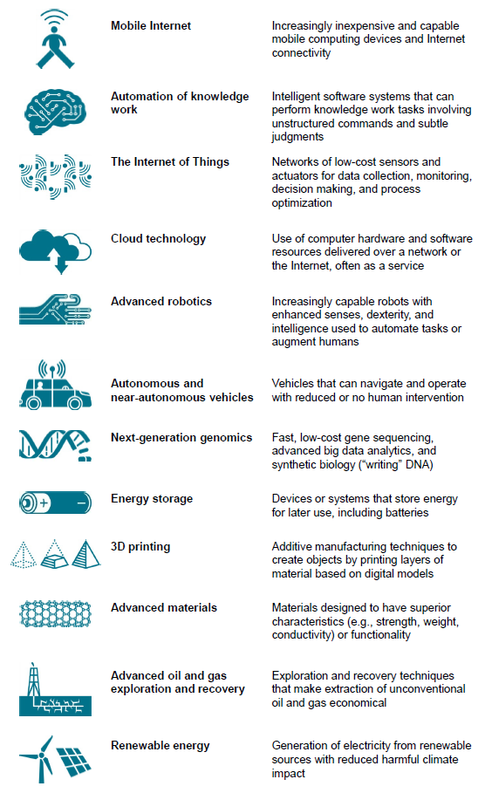 Back in May 2013, McKinsey published a report highlighting twelve emerging technologies that will transform life, business, and the global economy. Now, those of us who are familiar with behavioural economics will understand that forecasting is an inherently imprecise sport. Even so, with the benefit of hindsight, it is undeniable that the McKinsey researchers have mostly gotten it spot on. Technologies like Mobile Internet and Cloud Technology have already attained mainstream adoption since the report’s publication. And others, like Automation of Knowledge Work and Autonomous Vehicles, are expected to make their mark in the next five to 10 years. What is the common thread underlying all these technological innovations? 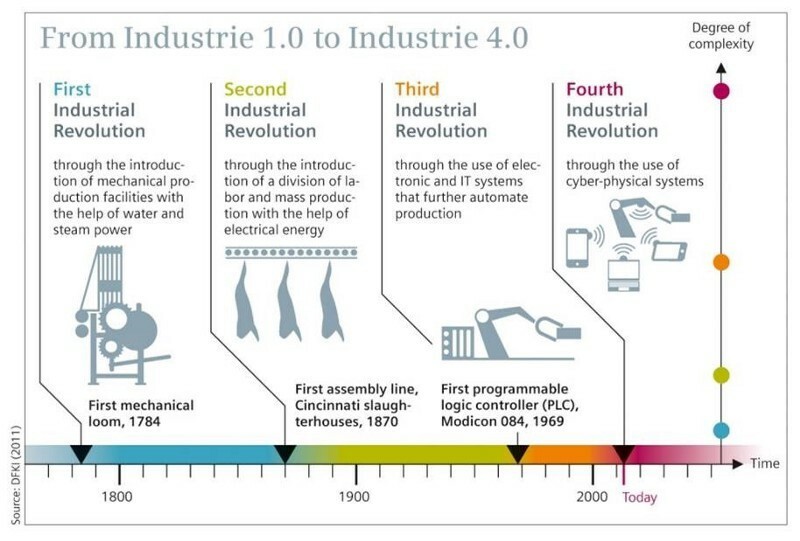 It is the advent of the Fourth Industrial Revolution or Industry 4.0. The Fourth Industrial Revolution is essentially a digital revolution, and a revolution of technological breakthroughs, such as Robotic Process Automation, Artificial Intelligence, Blockchain and the Internet of Things. Its impact will be far-reaching as it will disrupt almost every industry in every country, emerging or developed. It is this fear of being disrupted and rendered irrelevant that is keeping industry executives up at night. This tech-driven revolution will force many companies to change their operating paradigm, from being manpower-intensive to being technology-centric. And this new way of working is simply a manifestation of the digital-first or digital by default strategy that all C-suite executives are now gushing about. From people following processes and supported by technology, to technology following processes and supervised by people. The role of people in organizations, and the jobs that they do will evolve. Essentially from “doing” to “thinking”. There are widespread fears that automation will displace and replace humans in the workplace (instead of just augmenting them). The good news is that based on research, less than five percent of all occupations can be fully automated using currently available technology. The bad news is that for around sixty percent of existing jobs, at least thirty percent of their activities can be automated by robots. One consequence is that companies will adopt a variety of working arrangements to flexibly meet their business needs. Some of these new and old types of employment relationships include full-time employees, part-time or contract staff, offshoring and near-shoring, volunteers, freelancers (i.e. the gig economy), robots, artificial intelligence, and more. First, understand what your risk of being made redundant is. To find out, go to Will Robots Take My Job? For those of you who are doomed, you might want to start preparing yourself to take on the jobs on the future. Cognizant, for example, has put together a guide for getting and staying employed over the next ten years. It suggests 21 new jobs that will emerge and become the cornerstones of the Future of Work. 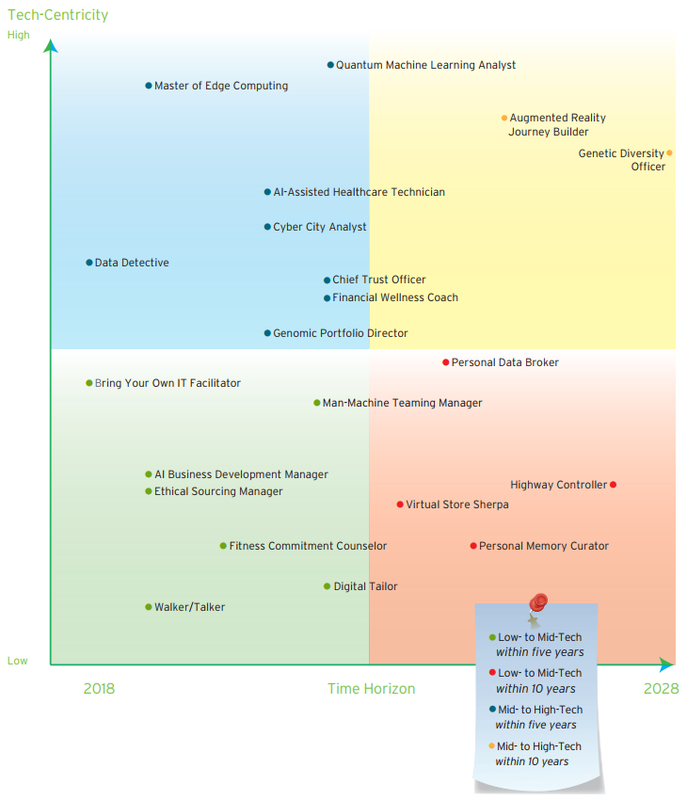 These jobs are categorized accordingly to their tech-centricity and time horizon, and range from the expected (Data Detective) to the weird (Man-Machine Teaming Manager). Besides identifying job opportunities of the future, it is important also to adopt a growth mind-set. Be prepared for lifelong learning, that is, to continuously un-learn old skills, and re-learn new ones. In particular, we should focus on skills that are likely to be in high demand in the new ten years. What might those skills be? Well, Oxford Economics has conducted a survey among 352 human resources professionals around the world, and identified the type of talent required as companies undergo rapid digital transformation. Digital skills — The fast-growing digital economy, emergence of social media and increasing popularity of e-Commerce all points to the need for digital business skills. Agile thinking skills — To use an often-quoted phrase, change is the only constant in this Volatile, Uncertain, Complex and Ambiguous (VUCA) economy. Talent who are flexible and nimble in their thinking will command a premium. Interpersonal and communication skills — In this age of the Fourth Industrial Revolution characterized by extreme automation and connectivity, it is the soft skills that will set talent apart from machines. Global operating skills — The trend towards globalization is irreversible, and will only gather further momentum as the world economy digitize. A global operating mind-set will thus become a necessity. And to love what you do, you need to do what you love. Ultimately, it is the passion for your work that will keep you engaged and energized to put in the hours necessary for you to become good at it. And that, you will realise, is how humans can differentiate themselves against robots or machines. We have seen how disruption is changing the world around us, underpinned by technological innovations. We are now in the era of the Fourth Industrial Revolution where the nature of organizations and the Future of Work will change radically. Change is Inevitable … Now How do We Deal With It?